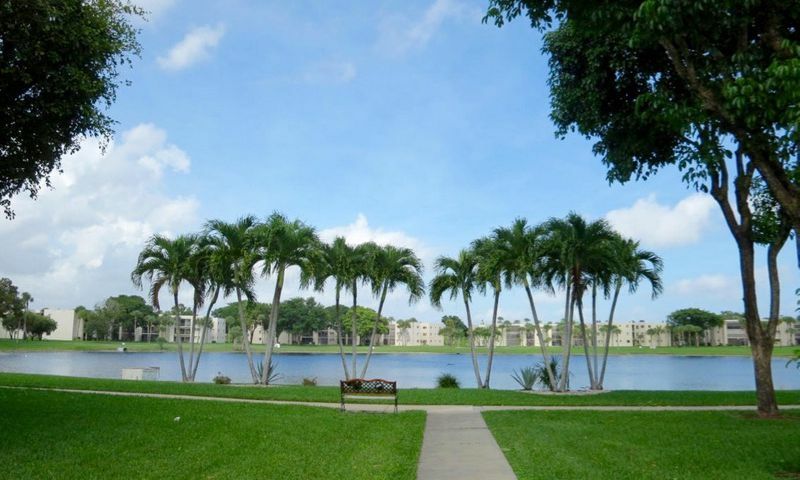 Las Verdes is a 55+ community in Delray Beach, Florida. This gated active adult neighborhood features resort-style amenities, low-maintenance homes, and an active social calendar. The tranquil and natural setting provides opportunities for residents to enjoy the outdoors like scenic walking trails and beautiful pond views without having to travel far from home. Active adults also benefit from living in Palm Beach County and its proximity to everyday conveniences and attractions. The central hub of physical activity and social recreation is at the Las Verdes' clubhouse. Here, residents enjoy a myriad of indoor and outdoor amenities that keep them busy all year long. They can stay healthy by working out in the exercise room followed by a relaxing sauna session. Residents can attend a party or event in the ballroom that is sure to keep them dancing and having fun. A catering kitchen is on hand to prepare snacks for club meetings. Social spaces like a multi-purpose room, card room, billiards room, and library are perfect for mingling with neighbors. Outdoor amenities are sure to please residents as well. The main pool and spa is located behind the clubhouse and there are two satellite pools available on opposite ends of the community so homeowners are never too far for a refreshing swim. There are plenty of sports courts in Las Verdes too. Residents can play tennis, shuffleboard, bocce ball, or handball at their leisure. Las Verdes is surrounded by walking and biking trails as well as scenic ponds that provide a beautiful backdrop to the neighborhood. Las Verdes was developed between 1980 and 1988. Homebuyers can choose from a variety of resale homes such as condo units or attached homes. There are ten condo buildings in Las Verdes. These are three-story buildings with units ranging in size from approximately 676 to 1,200 square feet. They have one to three bedrooms, one to two bathrooms, and assigned parking spaces. Condo units feature spacious layouts, walk-in closets, private balconies, screened-in patios, and updated appliances. Attached homes are one-story villas that offer approximately 680 to 1,696 square feet of living space. These attached villas have one to three bedrooms, two bathrooms, and an attached one-car garage. Some features include open layouts, hurricane shutters, carpet or ceramic tile floors, granite countertops, updated appliances, covered patios, dens, and plenty of storage space. Las Verdes promotes an active lifestyle by offering plenty of activities, events, clubs, and classes for all homeowners to enjoy. An activities director is on-site to help plan and organize events in the community. They can join the Italian American club, bocce club, tennis club, men's club, women's club, or snowbirds club. Residents will have fun playing bingo, billiards, cards, or games with friends and family. Neighbors can get to know each other better at events like a wine and cheese party or other holiday parties. Chair yoga and aquacise are just some of the other ways that residents can maintain an active and fun lifestyle in Las Verdes. Ideally situated in Palm Beach County, Las Verdes is close to everyday conveniences and attractions. Just outside of the community's gates are grocery stores, banks, Delray Medical Center, Walmart Supercenter, Aldi, fast food chains, and restaurants. Sherwood Park Golf Club and Delaire Golf Club are nearby for golfers to play a quick round. Beautiful beaches with miles of sand can be found along the Atlantic Coast for fun in the water and sun. Homeowners will love having two international airports close by such as Palm Beach International Airport that's about 30 minutes away or Fort Lauderdale-Hollywood International Airport that's about 50 minutes away. Las Verdes is an attractive 55+ community with great amenities and in a desirable location in Southeast Florida. There are plenty of activities available in Las Verdes. Here is a sample of some of the clubs, activities and classes offered here. There are ten condo buildings in Las Verdes. These are three-story buildings with units ranging in size from approximately 676 to 1,200 square feet. They have one to three bedrooms, one to two bathrooms, and assigned parking spaces. Condo units feature spacious layouts, walk-in closets, private balconies, screened-in patios, and updated appliances. Please Note: Floor plans are not available at this time. Attached homes are one-story villas that offer approximately 680 to 1,696 square feet of living space. These attached villas have one to three bedrooms, two bathrooms, and an attached one-car garage. Some features include open layouts, updated appliances, covered patios, tile floors, dens, and plenty of storage space. Please Note: Not all floor plans are available at this time. 55places.com is not affiliated with the developer(s) or homeowners association of Las Verdes. The information you submit is distributed to a 55places.com Partner Agent, who is a licensed real estate agent. The information regarding Las Verdes has not been verified or approved by the developer or homeowners association. Please verify all information prior to purchasing. 55places.com is not responsible for any errors regarding the information displayed on this website.